CLEVELAND, OH – October 30, 2014 – Certified Security Solutions (CSS), a leading provider of certificate and PKI management software, consulting, and cloud services, announced Wednesday the immediate availability of the newest version of their Certificate Management System (CMS). Any device or individual that can share data over a common network should do so with the highest possible assurance of security in a scalable, cost effective, and reliable manner. Whether it is identity, data at rest, data in motion, in the cloud, or on a consumer device, CSS has the ability to provide cryptographically proven digital certificates that substantially enhance the security posture of an enterprise or on devices that comprise the Internet of Things. CSS’ Certificate Management System leverages years of PKI experience and best practices making the issuance, revocation, and operational management of all certificates in an organization scalable and entirely secure. 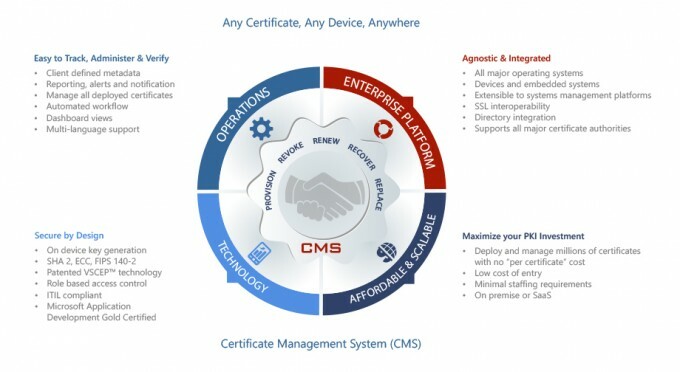 CMS is available as a software product, managed service, or cloud solution. CMS brings IT professionals everything they need to manage their infrastructure at scale, with a price point previously not available. Highlights include a new SQL Server certificate database, graphical reports, alerting, customer definable certificate metadata and more. Technical specifications, demonstrations, and 30 day trials of CMS can be found at www.css-security.com/cms. CSS is an information security company specializing in identity and access management solutions. Headquartered in Cleveland, Ohio, CSS has operations throughout North America. CSS provides enterprise ready software, managed security services, Security as a Service, and consulting services. CSS’ security solutions allow clients to securely operate in cloud computing platforms, “Bring Your Own Device” initiatives, and the emerging market of the “Internet of Things.” For more information and for a complete list of branch offices, visit http://www.css-security.com or email business@css-security.com.